After an evening of talking baseball, the day is finally here! It’s time to really see if the national pastime, the one thing the Caribbean countries are known, will actually live up to the hype. It’s time to play ball! This is the opening round of the San Juan pool, which is a powerhouse pool with Puerto Rico, Dominican Republic, Venezuela, and Spain making up the participants. The favorite to win the pool is the DR with a line-up that features not only Major Leaguers, but some of the top players in MLB, Jose Reyes and Robinson Cano. And for the opening game, we come out of the gates strong with the Dominican Republic vs. Venezuela, who is led by last year’s league MVP Miguel Cabrera. Needless to say, I am hyped for this event! Arriving to the stadium there is a festive vibe and a little tension in the air. The Venezuelan team has added incentive to perform well as the country’s president, Hugo Chavez passed, and this will be the first country-wide event since his passing. So not only is the team playing against one of their strongest rivals, but the entire country is watching hoping that their beloved baseball team will be able to bring home a victory for their fallen leader. Entering Hiram Bithorn Stadium (which was the former home of the Montreal Expos, who was known for their commitment to scouting and signing Caribbean players), the horns are blowing and beats of drums are filling the air, and at that moment as I see the field, I know that I am in for something special. What I didn’t know is what the special would be…. 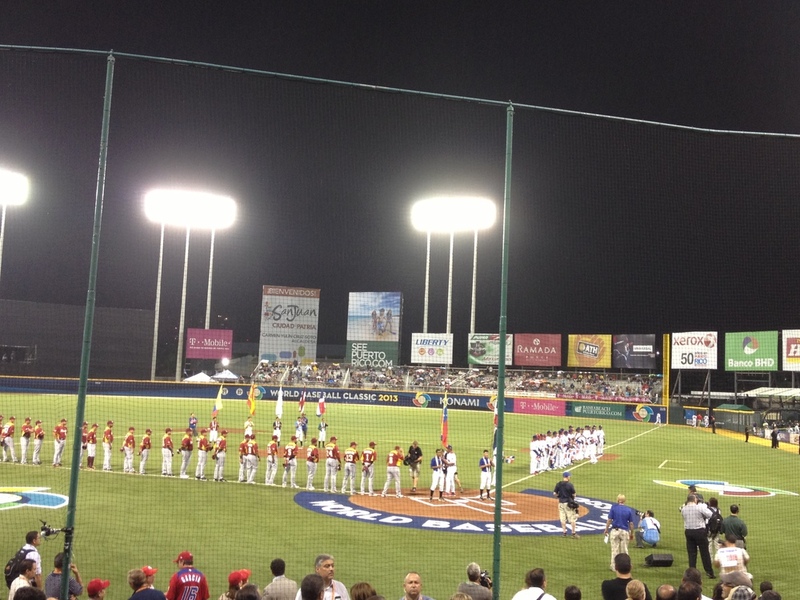 Teams are introduced, and they line the first and third base foul lines and each country’s national anthem is played. Fans are singing with passion and waving flags as if it is the 4th of July in the states. And as I finally find my seats, which to my surprise were about five rows from the field, in between home plate and the Dominican dugout, it’s time to play ball. 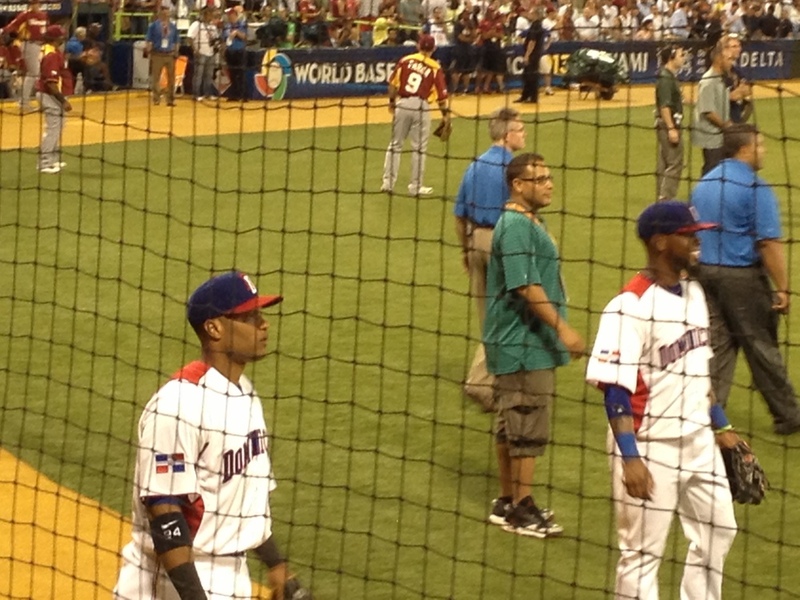 First players I see, Cano and Reyes warming up in front of me. And as I see men, women, boys and girls trying to get a photo, glimpse, or reconnect to the players, I quickly realize these guys are legends in their own country. For the people of DR, these are the guys that made it, they are the successful ones. 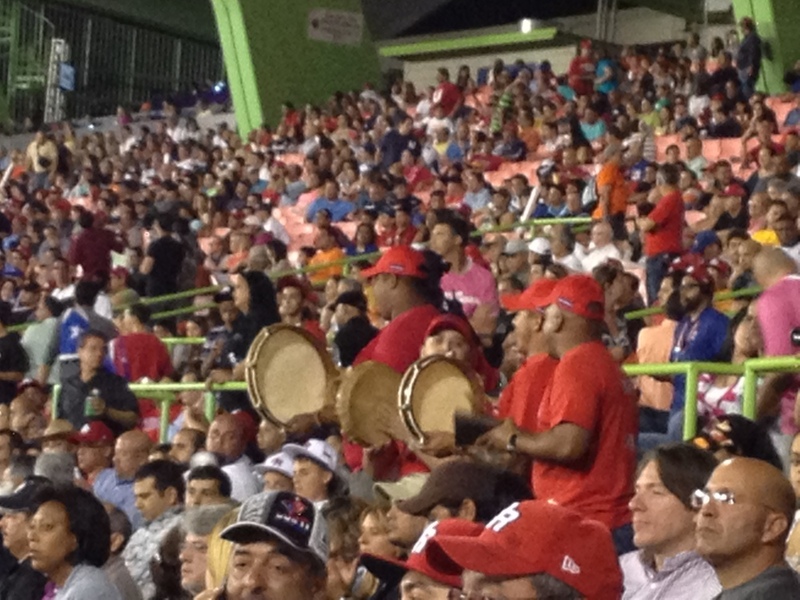 But after that quick revelation, I turn back to the scene in the stands…the crowd is rocking, singing, blowing airhorns, beating drums, chanting for their country, this is international baseball at its finest and I am in baseball heaven! First pitch: strike and the crowd rocks…and I am thinking here we go! Each pitch the crowd is on the edge of their seats, anticipating what the catcher is going to call next. 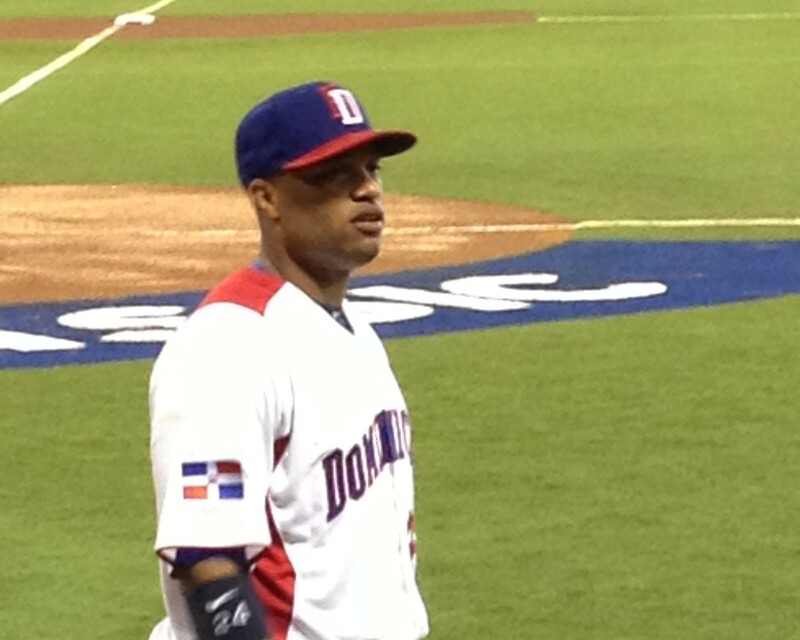 And after a relatively easy inning the Dominican team comes up to bat. And here was the real dominance. Reyes leads off…hit, stolen base, hit and the DR is up early. But more importantly, the Venezuelan pitcher can’t throw a strike. And this became the theme of the night (JUST THROW A STRIKE!) After about the third inning and a couple of pitching changes, the fun starts…its raining! Shades of Barcelona, when it starts raining at the soccer match, the skies decide to open up. After a 45-minute rain delay, the tarp is pulled and we are ready to start playing again. But the poor pitching continued. 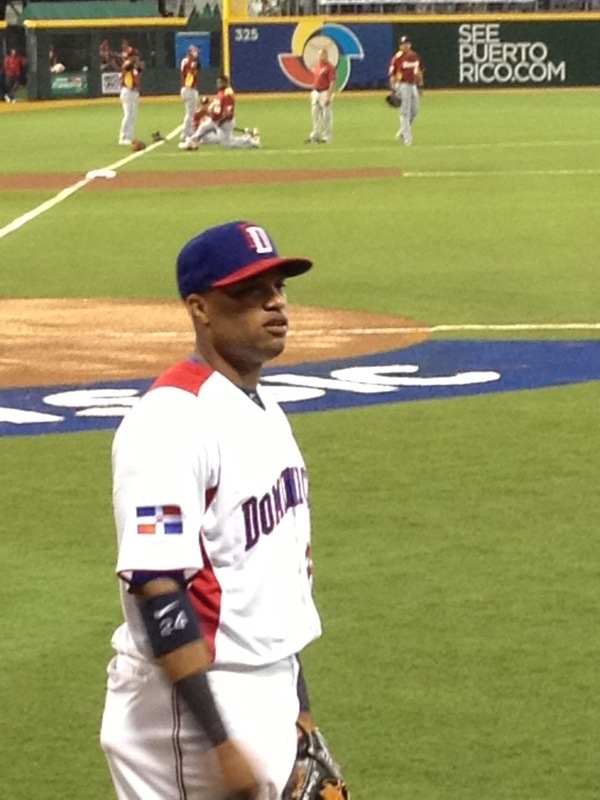 Yet the dominance of the Dominican team was evident, but the Venezuelan team isn’t ready to give up without a fight. What was definitely evident was the love the Venezuelan’s had for their country hero, Miguel Cabrera. At each at-bat and after each pitch, the chants of M-V-P, like Lebron and Kobe at the foul line were echoed throughout the stadium. 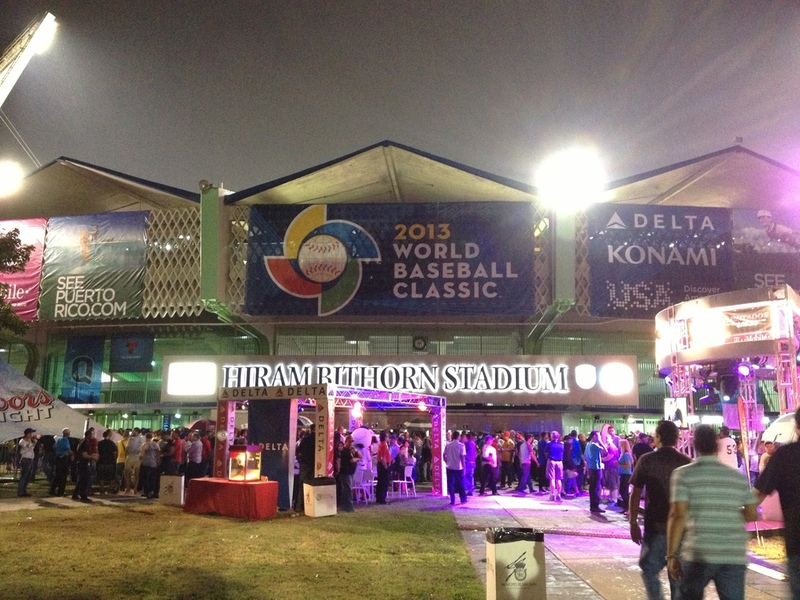 So, after a 5 1/2 hour game, the Dominican team came through the victory. The DR stars, Cano and Reyes showed why they were at the top of their game and the DR team demonstrated that they could be a tough out with their speed, strength and superior defense. The rivalry between DR and Venezuela proved to be less due to the inability of the pitchers to throw a strike. But hey, I am still in baseball heaven!